When glucose is converted to pyruvate during glycolysis , two adenosine triphosphates ( ATPs ) are formed, but most of the energy in the original glucose remains in pyruvate. In most aerobic cells, the pyruvate formed by glycolysis is further degraded in a pathway called the Krebs cycle (also called the tricarboxylic acid cycle or citric acid cycle). In the Krebs cycle, the carbon of pyruvate is fully oxidized to carbon dioxide in a series of oxidationreduction reactions. During these reactions, much of the energy in the original pyruvate is carried as high-energy electrons by the electron shuttles NADH and FADH 2 . These electrons will ultimately be passed to the electron transport chain, where their energy will be used to synthesize ATP by oxidative phosphorylation . Much more ATP is made by the Krebs cycle and oxidative phosphorylation than by glycolysis alone. In eukaryotic cells , pyruvate is transported to the mitochondrial matrix , where the Krebs cycle takes place. Before entering the Krebs cycle, the three-carbon pyruvate is oxidized to a two-carbon acetate molecule and carbon dioxide, producing one molecule of NADH. The acetate joins to a molecule of coenzyme A to form acetyl coenzyme A, which carries the acetyl group to the Krebs cycle. The acetate enters the cycle by combining with OAA (oxaloacetic acid) to form citric acid. At this point, two of the original three carbon atoms in pyruvate have been incorporated into citric acid and one has been oxidized to carbon dioxide, and one molecule of NADH has been produced. As the reactions of the Krebs cycle continue, the two acetyl carbons are successively oxidized to carbon dioxide, forming two molecules of NADH and one of FADH 2 , which will provide electrons to the electron transport chain to form ATP. In addition, one guanosine triphosphate (GTP) is formed directly by substrate-level phosphorylation , or transfer of a phosphate directly from the reacting molecules. (The GTP eventually transfers its phosphate to form ATP.) The final unoxidized product of the entire cycle is OAA, which can accept another acetyl group to start the cycle again. 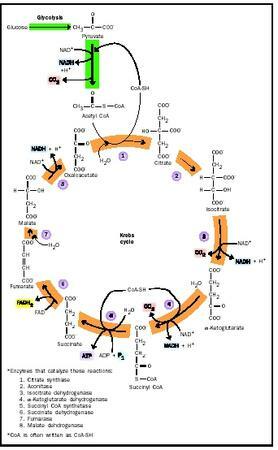 The Krebs cycle occupies a central position in cellular metabolism . It can break down the pyruvate produced in glycolysis, but these two pathways do not form an isolated system in cells. Both are linked to other processes in many ways. Acetyl coenzyme A is produced by other means, notably by fatty-acid oxidation, and the Krebs cycle will oxidize this acetyl coenzyme A as readily as that produced from pyruvate. The series of reactions that make up the Krebs cycle. needs. For example, amino acids can be consumed by entering the Krebs cycle at several points. Conversely, several amino acids can be synthesized from intermediates of the Krebs cycle. Thus the Krebs cycle can serve either to degrade amino acids, releasing energy in the process, or to supply precursor molecules for amino acid synthesis. Which of these activities prevails depends on the needs of the cell at any particular time. Bodner, G. M. "The Tricarboxylic Acid (TCA), Citric Acid or Krebs Cycle." Journal of Chemical Education 63 (1986): 673–677. Hinkle, P. C., and R. E. McCarty. "How Cells Make ATP." Scientific American 238 (March 1978). Racker, E. "The Membrane of the Mitochondrion." Scientific American 218 (February 1968).